There's a very good How-to on the Ubuntu support pages under https://help.ubuntu.com/community/DialupModemHowto that tries to cover all bases for the five main modem families, while one or other of the six methods will probably work if you know a little of what you're doing! This is a walk-through of the most basic. Bear in mind this example is specific to the Conexant HSF modem in my Dell 6400. For this I'll assume you know your ISP, dial up numbers, Login, password and have a means to lookup and get files onto the machine you're configuring. Find out what modem you've got; even if you've got manuals and driver CD's, assume nothing. You will need the right info for a Linux install. Get an appropriate driver (in this lucky case, a package; otherwise you'll need the source code to compile), install it. Identifying PCI bus slots with candidate modems. The High Definition Audio card with PCI ID 8086:27d8 may host a soft modem chip. Writing residual guidance customized to your System. Please read 1stRead.txt first for Guidance. A round of applause for scanModem for doing all that and leaving you with at least thirteen text files, which will tell you more than you ever wanted to know. What the scanModem files tell you. 1stRead.txt: Start here. This file outlines what files scanModem wrote specific to your modem chipset , such as Smartlink.txt, Conexant.txt, Intel.txt , etc. YourSystem.txt and ModemData.txt: These contain guidance about your particular set-up, outlining sound and modem components and their addresses (old versions may still refer to one file, YourModem.txt). DriverCompiling.txt: This explains the roles of additional files which may have to be installed to support compiling of modem drivers and the steps to take if you need to compile from source. SoftModem.txt: Information and instructions about 'soft modems' - virtual devices sitting on top of the hardware chipset. Most 56k modems have a host ID for the primary audio or modem controller (soft modem), with diverse subsystems to run the actual dial up link. It is the chipset of the Subsystem which determines the driver you need. Intel.txt, Conexant.txt: info file about the modem 'family' detected in your machine, providing guidance on what drivers to use. You may get one or more modem family files depending on the controller and chipset. Testing.txt: (formerly ModemTesting.txt) read this after your drivers have been installed to help you test. wvdial.txt: this is sample a wvdial configuration file – the text file that contains the dial-up settings - we'll generate our own wvdial.conf file later. InfoGeneral.txt: has general information about the status of win-modem support under Linux. Do read this if ModemData.txt reports that your current modem is not supported under Linux. Others: scanout.00:1b.0 contains technical output from the scanModem diagnostics. Rational.txt and Unsubscribe.txt contain general info from the scanModem development team. This is the logical modem device name that we'll need to configure. In my Conexant.txt file, this goes into more detail. Vendor ID, sub-systems and revision numbers are useful for the more obscure models. 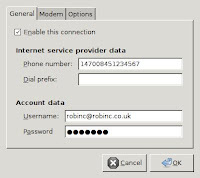 Modem drivers are not, to my knowledge, supported in the repositories, so you will have to track them down yourself using a combination of user forums and search engines. If you're lucky enough to see an HSF-type modem, you can get a driver package. I've found the Dell HSF driver [hsfmodem_7.60.00.18oem_i386.deb] also works in non-Dell machines. 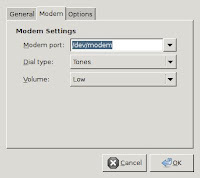 Modem drivers for Linux are often commercially supported, for example, the HSF Modem package from Linuxant.com is a free test package providing only a low 14K speed; they charge a license fee for the full-speed 56k version. Sticking with my basic example, I downloaded and installed hsfmodem_7.60.00.18oem_i386.deb. In Ubuntu you can use 'Open with GDebi Package installer' from the file manager and get the package utility to do the legwork for you - it will also flag any other package dependencies. If you go this route on a machine also equipped with wireless, my best advice is switch off your broadband router while you set-up and test your dial-up link. My wireless adapters have a habit of trying to reconnect the broadband even when I don't want it and that's just going to confuse things. Open the Network Interface applet from the Gnome panel or from System > Administration > Network. 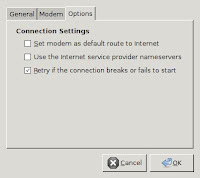 If all your drivers installed correctly you should now have an entry in the list for Modem Connection (status check-box will be empty). Select it, then choose Properties. You get a three-tab properties pane to fill in. Check the box for 'enable this connection'. The modem port should reference the logical modem name - /dev/modem in my example. As long as your driver installed OK, this should be selectable from the drop-down list. Dial type should be set to Tones for most modems. Volume can be anything you want, but I find it reassuring to hear the tone dial and the connection handshake so I know its working. I don't want dial-up as my default link, so I left Set modem as default route to internet blank. My ISP doesn't mandate Use the Internet provider nameservers, so I left that blank. As dial-up isn't so robust, I checked the box for Retry if the connection breaks or fails to start. Click on the OK button. This will create one of those wvdial.conf files in the background which contains the account settings to use. Back in the Network GUI, you should now be able to check the box for Modem Connection to start the dialler! 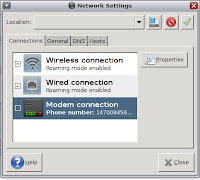 You may want a visual clue to your connection status; you can add the Gnome Modem Monitor applet to the panel – right click an empty area on the panel, choose Add to Panel and Search on 'modem'; it will appear under the System and Hardware category.